On April 2, 2016, President Cornwell’s Inauguration began with a Day of Service. Not even the rain could damper the spirits of members of the Rollins community as they participated in various projects ranging from the beautification of Central Park, a Habitat for Humanity build-out, and the Welbourne Avenue Nursery clean-up. To exhibit Rollins’ interest in the well-rounded individual, other events of the week included Research Scholarship and Arts Showcases, panels on “What Matters in College” and “Liberal Education in This Global Era,” and a two-hour Inauguration ceremony. The week concluded on the night of April 9 with a fun-filled Festival of Light. “An inauguration is really a time for a college to take stalk at itself, ground itself in its mission, reflect on its history, and imagine its future,” said President Grant Cornwell, who appeared especially humbled by the greetings expressed by a number of his colleagues at the Ceremony. Both nationally and internationally recognized educational leaders participated in this stepping stone for Rollins College, and the future looks bright. 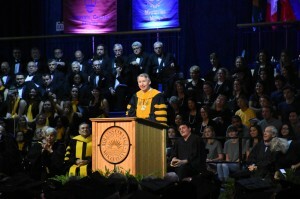 The theme of several events as well as President Cornwell’s inaugural speech emphasized the importance of a liberal arts education, not only in upholding Rollins’ mission of global citizenship and responsible leadership, but also in providing employers, and more importantly society, with tomorrow’s groundbreakers. Through acquired critical thinking skills and transformative leadership that the liberal arts provide, however, “liberal education embraces diversity and creates fuller, more successful communities. There can be no higher calling or higher value than kindling that light in students to become conscious of their choices and the consequences of those choices,” said Dr. Cary Geary Schneider, President of the Association of American Colleges and Universities, upon introducing President Cornwell.